As we enter 2018, my sense is that God has been growing the Rethinking Hell movement at an encouraging pace. I don’t have statistics to prove it, but my feeling is that belief in Conditional Immortality is on the rise. This is something to thank God for. There’s still a lot of work to do. On the one hand, the belief that God will torture the unrighteous forever is still very widespread and is still the dominant belief in most Christian churches and institutions. This error is deeply rooted. On the other hand, as more and more people become skeptical of eternal conscious torment, by no means are all of them embracing Conditional Immortality. The error of Universalism seems to be on the rise. God has called many of you who are reading this to work to help others understand what the Bible truly teaches about Hell and the final fate of the unrighteous. How should we think of this work? It is a labor of love. It is a teaching ministry. And, like all of God’s work and like every ministry, there is an aspect of spiritual warfare involved. We are in a spiritual struggle. In a sense, all of life involves spiritual warfare. Our efforts to correct a very longstanding, broad, and deeply rooted misunderstanding of the Bible involves us in one aspect of the good fight we are called to fight. I am not a prophet. I don’t know what is coming with respect to our movement. But it would not surprise me if sometime soon, as belief in Conditional Immortality grows, we see significant conflicts over this issue in denominations, churches, and Christian institutions. We should pray for truth to spread and peace to be maintained at the same time. But we must be prepared for painful conflicts, even though we do not want them. 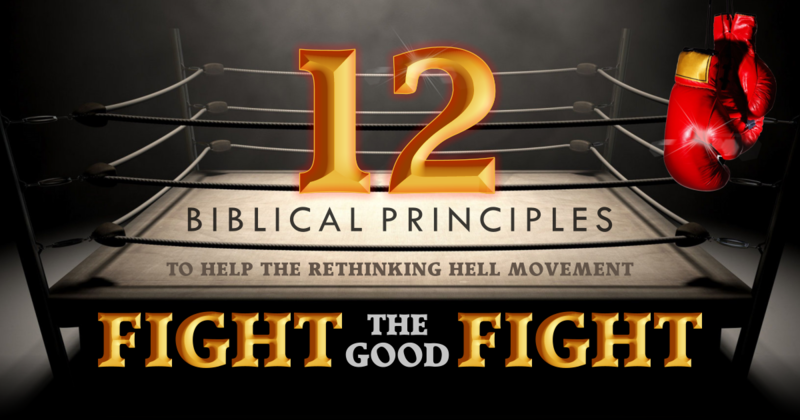 In this article, I want to share with you some principles for fighting “the good fight” (see 1 Timothy 6:12 and 2 Timothy 4:7). These are principles I learned from the Bible and from serving the Lord. I’ve been blessed with opportunities to serve the Lord in a variety of settings: in school, college, and seminary; for five years in the US Navy serving on nuclear submarines where in addition to my other duties I was the volunteer lay leader for Christian services; for fourteen years living in a Muslim majority nation where we shared the love and truth of Christ with our neighbors; and for the last seven years as a pastor in North Carolina. While these experiences are quite diverse, I have found that the Biblical principles for spiritual warfare are the same in many different settings. Here, I will share my thoughts about how twelve of these principles apply to the Rethinking Hell movement. 1. Remember who our enemy is. I thank God that the founders and leaders of the Rethinking Hell movement have consistently emphasized and practiced respect for our brothers and sisters in Christ who disagree with us. Traditionalists and universalists may be our debate opponents, but they are never our enemies. NIV 2 Corinthians 10:5—We demolish arguments and every pretension that sets itself up against the knowledge of God, and we take captive every thought to make it obedient to Christ. In another sense, our enemies are the spiritual forces of darkness who promote confusion about God’s truth and use such confusion to oppose God’s mission in our world (see Ephesians 6:12). NIV Romans 12:18—If it is possible, as far as it depends on you, live at peace with everyone. Again, from my perspective, the Rethinking Hell founders and leaders have done a good job in this area. My purpose in writing this is to encourage all of us to keep seeking to live in peace. Maintaining peace often requires a lot of effort. In fact, three times we are told to “make every effort” to maintain peace (Romans 14:19, Ephesians 4:3, and Hebrews 12:14). Our unity in Christ is far deeper and stronger than our disagreements over the nature of Hell. At the same time, we should remember the words, “as far as it depends on you”. Sometimes, despite our sincere efforts and hard work, others will not be willing to live in peace with us. In such situations we must trust God’s grace and press on. It took me a long time to transition from a firm belief in eternal conscious torment to a firm belief in conditional immortality. Some people are wired to quickly see and adopt truths which are new to them and to their community. Others are more cautious. We need both types in the Church. So, if your friend, pastor, or teacher is not immediately won over by the biblical evidence and careful explanation you present, be patient. In some cases this will mean not discussing this topic for a while. In other cases this will mean patiently continuing to discuss it if they are open. Ask for wisdom and God will give it to you! 2 Timothy 3:16-17—All Scripture is God-breathed and is useful for teaching, rebuking, correcting and training in righteousness, so that the servant of God may be thoroughly equipped for every good work. If you believe the Bible teaches conditional immortality and annihilationism, then you have seen a truth which the majority of Christians around the world and throughout history have misunderstood. That’s good, but it is also dangerous. It is dangerous because there is a risk of feeling that there is something about you (smarter, more committed to the Bible, more courageous) that makes you better than other Christians who don’t share our understanding. This could lead to soul damaging pride. It is far better to be a humble traditionalist or universalist Christian, than a proud conditionalist. I don’t say this because I have seen much evidence of pride in our movement, but because it is a constant danger for all Christians. In urging you to seek peace and be humble, I in no way want to discourage you from teaching the truth about conditional immortality with God’s strength and courage. And you will often need courage! Tragically, whenever a long standing traditional view is challenged, no matter how respectful the challenge, and no matter how much Biblical evidence is carefully presented, there will be opposition. So in addition to patience and humility, we constantly need God’s strength and courage. Sadly, some of us will suffer persecution for attempting to correct the errors of eternal conscious torment and universalism. It is not likely that you will be literally flogged, imprisoned, or killed, as many Christians have been in the past when God called them to correct wrong teachings. But we should not take lightly the types of suffering that some have faced and more will face. This includes false accusations, slander, loss of friendships and relationships, and for some, significant financial loss and suffering. The financial loss (which hurts so much because it hurts our families) may be direct, in the form of being fired, or indirect, in the form of not being considered for a position for which you are well qualified. Because there is so much opposition, we need to keep in mind the Lord’s command to be both wise and innocent. Being innocent means that we must constantly be on guard against all types of sins and sinful attitudes which will give our opponents opportunity to harm and attack us and will bring our cause into disrepute. Being wise means that while we are courageous we also exercise care, caution, and patience. We should never be dishonest (that would not be innocent), but we should sometimes be quiet and patient. It is not always the right time or place to promote conditional immortality. It’s not always easy to balance boldness, courage, patience, and wisdom. One way God gives us wisdom and guidance is through fellow believers, especially those who have been through many struggles and trials. If you are a teacher or pastor who is struggling with how to best teach on the topic of conditional immortality and annihilationism in a setting where there might be conflict, I encourage you to consider contacting myself or one of the other leaders in the Rethinking Hell community. We need to listen to, share with, and pray for one another. Our real spiritual enemies do not fight fair. We are rightly focused on biblical exegesis, how to present truth clearly, and opportunities to share the truth we have found. But don’t expect the devil’s main counterattacks to take the form of biblical exegesis and calm arguments. The military sometimes refers to “asymmetrical warfare”. This term describes the fact that an enemy may use far different tactics than we use. In physical warfare, one side may go to great lengths to avoid civilian casualties, while the other side intentionally chooses “soft targets” which include women and children. In an analogous way, the devil does not fight fair. If God is using you to help others more clearly understand biblical truth, the devil may attempt to attack your family or your health. He may seek to tempt you in areas which are not directly related to the topic you are focused on. He knows that if you fall into serious sin it will not matter how gifted a teacher you are or how accurate your beliefs are because your testimony will be ruined. So, with the help of God, be on guard! 10. Stay close to Jesus and to each other. ESV John 15:5—I am the vine; you are the branches. Whoever abides in me and I in him, he it is that bears much fruit, for apart from me you can do nothing. One way to stay close to Jesus is to stay close to other Christians. Always remember that God’s work is a team effort, a group thing, and a family affair. I’m thankful that when it comes to the specific work of correcting wrong beliefs about the eternal destiny of the unsaved God has provided us with the Rethinking Hell community. At the same time, most of your fellowship should come from the local community of believers you worship and serve with, whether or not they share our view on conditional immortality. By all means, be “poured out”, but don’t allow yourself to “burn out”. What is the difference? Both being poured out and burning out may look similar on the outside at first. The difference is that when we are being poured out we are growing closer and closer to God, but if we are burning out we are moving away from intimacy with God as we depend on our own strength, which will surely fail. God sometimes wants us to take Sabbath rests. In the Old Testament, there was not only a day for rest each week, there were also longer periods of Sabbath rest. So seek God’s will to find His balance of hard work and peaceful, renewing rest. If you need to leave the specific efforts of Rethinking Hell for a day or a season, do so in God’s grace. Taking Sabbath rests demonstrates that we know that the work ultimately depends on God and not on us. When you rest, always rest in the Lord, never rest from Him. Finally, remember this is God’s work. God’s work always depends on prayer. I think God gives prayer such a central role in order to help us constantly remember Him as we are serving Him. So pray for the Rethinking Hell movement. Pray for our leaders and members. Pray that God will open many eyes to His truth. Pray for those who oppose us. Pray for protection from evil. Pray that God will be glorified and His Name honored as a result of our humble efforts. As you pray, thank God for all He has already done. This movement has come a long ways. God is working. Expect Him to continue to work and to bring much good fruit out of our efforts. 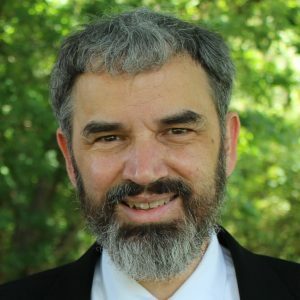 PreviousUpcoming Event: Rethinking Hell Conference 2018 in Dallas–Fort Worth (March 9–10)!